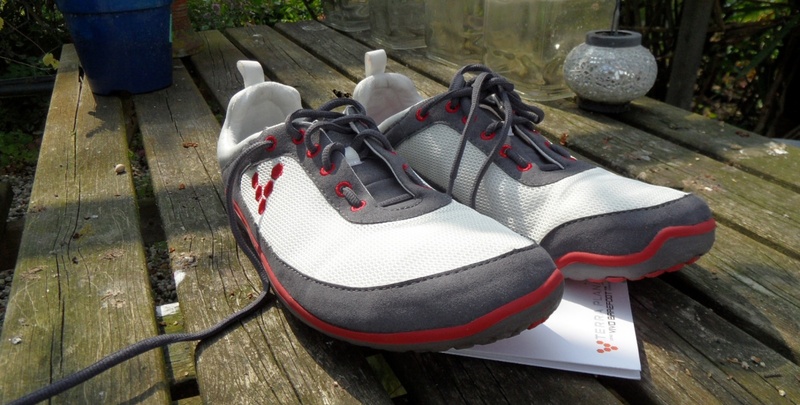 I have wanted these shoes since I had the opportunity to test the VIVOBAREFOOT Evo at a barefoot race in Tilburg a few months ago. They felt excellent, but at that point I was still a new runner and investing such a large sum of money (160 euro) was not in my budget at that time. 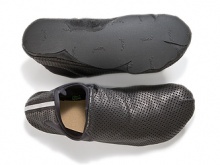 I kinda regret not getting them now because I could have been running in minimal shoes for the past two months instead of starting now with the VIVOBAREFOOT Neo. It took a while to receive the shoes, so that gave me ample time to do some research. I am a worrier, and the more I found out about the VIVOBAREFOOT Neo, the more I worried. I started to wonder if this was more of a casual shoe in lieu of a running shoe. I worried: Will they be too heavy? Are they way too minimal? Will they ventilate properly with so much fabric? 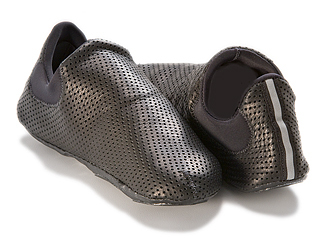 They market the Neo as a performance shoe which could really mean just about anything. Soft Star Shoes was one of the first companies that I discovered when I started searching for a truly minimal shoe over a year ago. 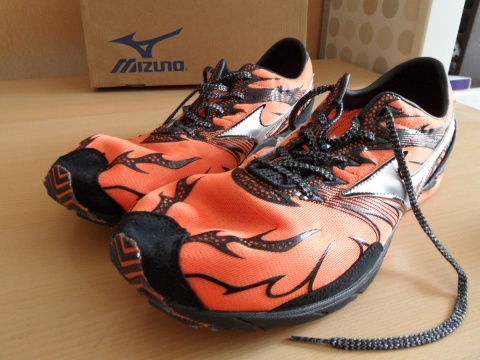 Their products always caught my interest but as a beginning barefoot runner I just couldn't commit to buying a pair of RunAmocs. They were a bit too radical in appearance, minimalism, and honestly price. Now, as a more seasoned barefoot runner I was excited to see that Soft Star was introducing two new models, the DASH RunAmoc and the Moc3. Soft Star graciously offered to provide me with my choice of either model to review and test and encouraged me to explore their website so that I could make the choice that would fit me best. I was very impressed by the Soft Star Shoes “Elves” (as they call themselves) who were nothing but gracious and helpful while I made my tough decision on which model of shoe to choose. I was finally won over by the Moc3 due to the fact that the shoe was a slip-on and that the sole was a 2mm Vibram specially cut to allow extra flexibility while running. I got these a few days ago and, even though I was supposed to take a rest, I couldn’t resist doing a short thirty minute run in them just to see how they feel. I was curious about how they would perform because they were very light and pretty flexible compared to what I am used to. I like the way the shoe looks. They look much better than the Mizuno Wave Universe 3 and, being Dutch, the orange color fits me perfectly. The decorative flames make the shoe look fast as well and helps keep the upper mesh in shape when you take the shoe off. Runkeeper is a running app that will work on android, iPhone and blackberry (my bad its not available on blackberry). It’s a pretty popular app and recently their pro version became free making it perhaps one of the most feature rich apps available. Besides having tons of features, it’s still quite easy to use. You can pick what activity you want to do. Then just press start activity and you are done. There is one small note though, It will start the activity whether or not you have GPS signal. I often startied an activity and had to press pause really quickly and then wait until it had a good GPS signal to start my run. I found this pretty annoying. The first time I ran with it, Runkeeper scared the hell out of me. Apparently it mentions every 5 minutes how far you have run and what your pace was. It does it in a pre-recorded (I think) voice making it sound quite nice. I really wanted to find the best running app so I decided to check out a few of them and write a concise but complete review on them. I’m starting with sportypal since I know that one the best. However at the time of writing this I’ve already been testing other apps. So if there are any questions on how this compares to other apps feel free to ask. Sportypal is a running app that can track your runs, walks, cycling or any other activity. Sportypal aims to be intuitive and very simple to use which it seems to do very well. It works on any android, iPhone, Symbian or blackberry. I briefly tried it on my old Nokia and it seemed to work very similar to the version on my android phone. I finally bit the bullet and ordered my very own pair of Merrell Trail Gloves from Running Warehouse. I just couldn't shake the feeling that I had to own a pair and after trying on the NB Minimus Trail (which I will provide my opinion on soon), I was sure the Merrell was the shoe for me. In case you haven't read Part 1 of my Invisible Shoes huaraches review, here's a bit of recap. 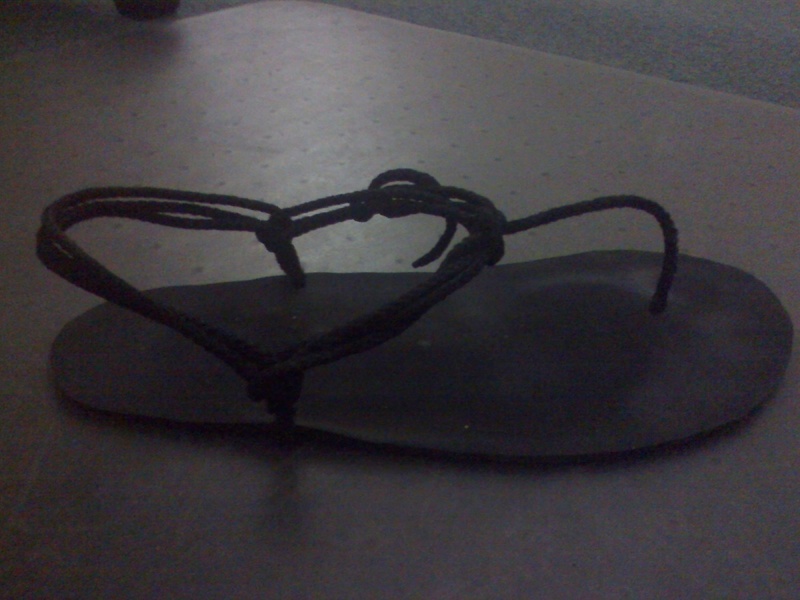 Huaraches are one of the most basic forms of footwear and consist only of a material that protects the bottom of the foot and a lace to secure them. They have been used specifically by the Tarahumara Indians and have been popularized by Chris McDougall's book Born to Run. Steven Sashen of Invisible Shoes decided to modernize the huaraches and offers a DIY kit on his website or he will custom make you a pair. Part 1 of this review chronicled the process of me measuring, cutting, and assembling my DIY kit. Part 2 is my review of running in the huaraches. When you are dealing with a shoe that is designed for this extreme level minimalism, I'm not sure that appearance is even a factor. I personally like the way the huaraches look. When the laces are tied in the slip on method (which I use), they retain a bit of shape and look like a very stripped down version of any sport sandal from manufacturers like Teva or Chaco. The only area to add a splash of personality to these shoes is in your choice of laces. There are quite a few choices for lace color with the DIY kit and I chose the black laces. I am glad I did so since I have adopted the huaraches as daily wear around the office and out in public. 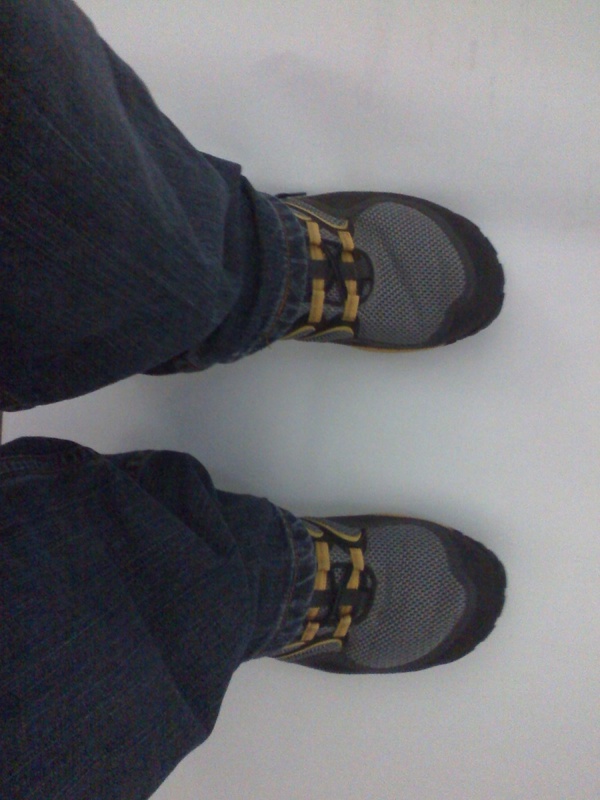 The black laces help to not make my footwear a focal point, especially around the office. I am proud to wear them anywhere and have gotten nothing but overwhelmingly positive comments about them. 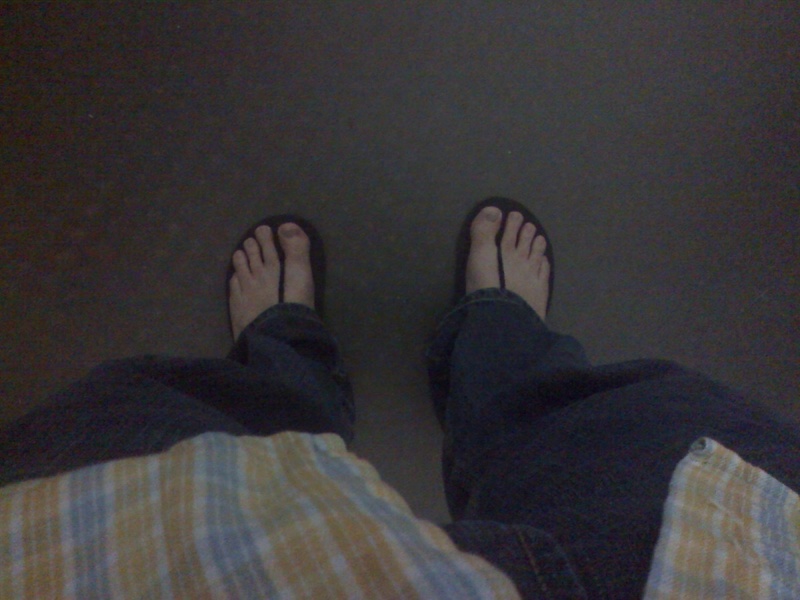 There are no second thoughts involved with wearing the huaraches out in public like there would be with FiveFingers.